Last major update issued on February 8, 2010 at 04:45 UTC. The geomagnetic field was quiet on February 7. Solar wind speed ranged between 312 and 378 km/s. Solar flux measured at 20h UTC on 2.8 GHz was 90.3. The planetary A index was 3 (STAR Ap - based on the mean of three hour interval ap indices: 2.8). Three hour interval K indices: 10000112 (planetary), 11101122 (Boulder). 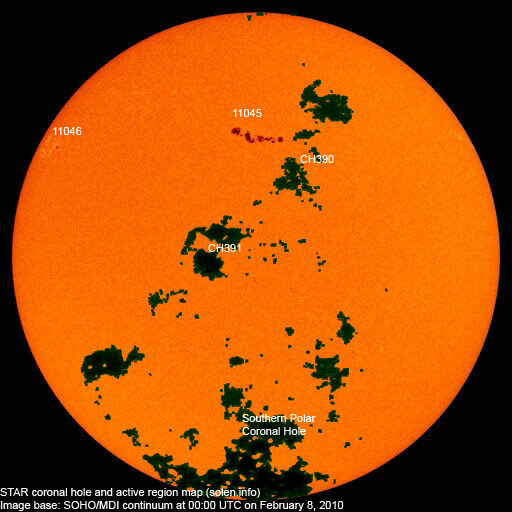 Region 11045 added many spots and more than doubled its penumbral area. The first magnetic delta structure weakened after the M6 event, however, a new delta structure has formed further east and the region remains capable of producing further major flares and Earth directed CMEs. Flares: A major M6.4/1N flare was recorded at 02:34 UTC. This event was associated with a CME which very likely will impact Earth, probably on February 9. Other flares: C1.1 at 03:29, C9.9/1F at 04:52, C4.2 at 21:15, C4.2 at 21:39 and C1.0 at 22:31 UTC. New region 11046 emerged near the northeast limb. February 5: No obvious partially or fully Earth directed CMEs were observed in LASCO or STEREO imagery. February 6: A CME was observed off of the east limb after an M2 flare in region 11045. A recurrent coronal hole (CH390) in the northern hemisphere was in an Earth facing position on February 6-7. 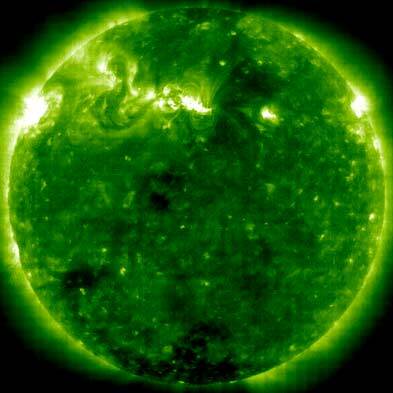 A coronal hole (CH391) in the southern hemisphere could reach an Earth facing position on February 8. Processed SOHO/EIT 195 image at 23:48 UTC on February 7. The darkest areas on the solar disk are likely coronal holes. The geomagnetic field is expected to be quiet to unsettled on February 8. 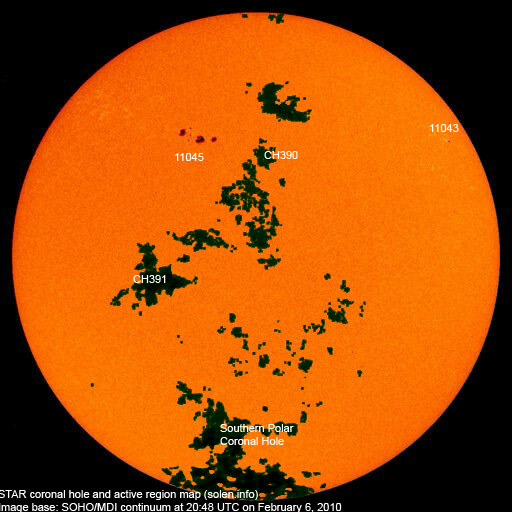 The CME associated with the major flare in region 11045 on Feb.7 could impact Earth on February 9 and cause unsettled to major storm conditions. A high speed stream from CH390 could cause unsettled to active conditions on February 10.